The official PanGu.io Jailbreak Tool for Mac OS X and Windows operating systems is now available for iPhone, iPad and iPod Touch devices running iOS 7.1.x Firmwares. Below you can read the full Guide and Tutorial on How to Untethered iOS 7.1.X / iOS 7.1.1 / iOS 7.1.2 Jailbreak for iPhone 5S, iPhone 5C, iPhone 5, iPhone 4S, iPhone 4, iPod 5G Touch, iPad Air 5G, iPad 4G, iPad Mini, iPad Mini 2 Retina, iPad 3G and iPad 2G Using Pangu Jailbreak Tool. 'PanGu Jailbreak Tool' is developed by Chinese developers team called 'PanGu' based on key members; @dm557 @windknown @modikr @tb557 @zengbanxian, Just like the developers of 'Evasi0n7 Jailbreak Tool' called team 'evad3rs' and their key members includes; @pimskeks @planetbeing @pod2g @MuscleNerd. According to @i0n1c and @iH8sn0w, Pangu Jailbreak is legit and free from all malware, moreover the jailbreak tool installs both Cydia and a Chinese App Store contains illegal apps. Pangu.io is the official website of @PanGuTeam. Pangu iOS 7.1.X Jailbreak Tool is fully supported, compatible and working with all Apple iOS Devices running any iOS 7.1.X firmware versions. Now let's start the Tutorial and Guide to Untethered iOS 7.1.X Jailbreak Using Pangu on iPhone 5S, iPhone 5C, iPhone 5, iPhone 4S, iPhone 4, iPod 5G Touch, iPad Air 5G, iPad 4G, iPad Mini, iPad Mini 2 Retina, iPad 3G and iPad 2G. Note: Before you start the below tutorial, make sure you have latest version of iTunes installed. Your Apple device is running iOS 7.1.2 or iOS 7.1.1 firmware, and it must be installed via iTunes, and not via OTA (Over-the-Air) (Settings – General – Software Update) process, otherwise try to restore clean iOS firmware via iTunes. Also make sure to cancel your screen lock. 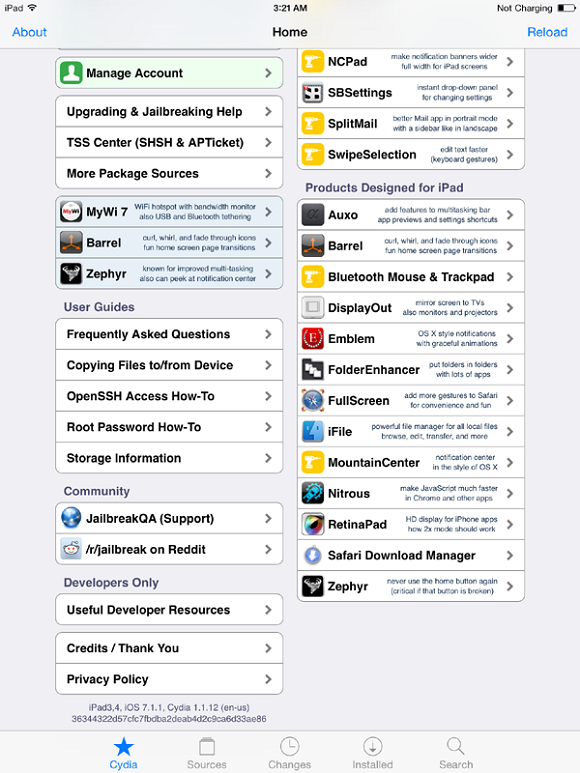 How to Jailbreak iOS 7.1.X Untethered on iPhone, iPad & iPod Using Pangu? Step 1: First, Download and Install 'Pangu Jailbreak Tool' via above mentioned links on your Windows and Mac OS X PCs / Laptops. Step 2: Now, Plug-in and Connect your iOS 7.1.X Firmware running iPhone, iPad or iPod device to your PCs / Laptops via USB cable. Step 4: Now, Click on 'Jailbreak Button' to start the process of iOS 7.1.X Jailbreaking. Step 5: After which, PanGu will be prompted and ask you to change the date and time on your iPhone, iPad and iPod Touch device. Now, Go to Settings > General > Date & Time, and 'Disable/Turn-off the Set Automatically' option. You will need to set the date to '02 June 2014' and set the time to '02:49 AM' or '20:30' (that’s 08:30pm for those who aren’t using the 24-hour clock) as mentioned in below image. Step 6: Now, Pangu Jailbreak process will begin and after that you will see the 'Pangu App' icon on your device 'Home Screen'. Tap Pangu icon to start the 'Pangu App'. Step 7: Wait a few moments patiently for completion of whole jailbreak process; it will take approx. 10-15 minutes. Step 8: Now, After the jailbreak process gets completed, Your device will be iOS 7.1.X Jailbroken with Cydia installed on your Home screen. Congratulations!! You're done. Now, Untethered iOS 7.1.x Jailbreak Using Pangu has been achieved successfully. 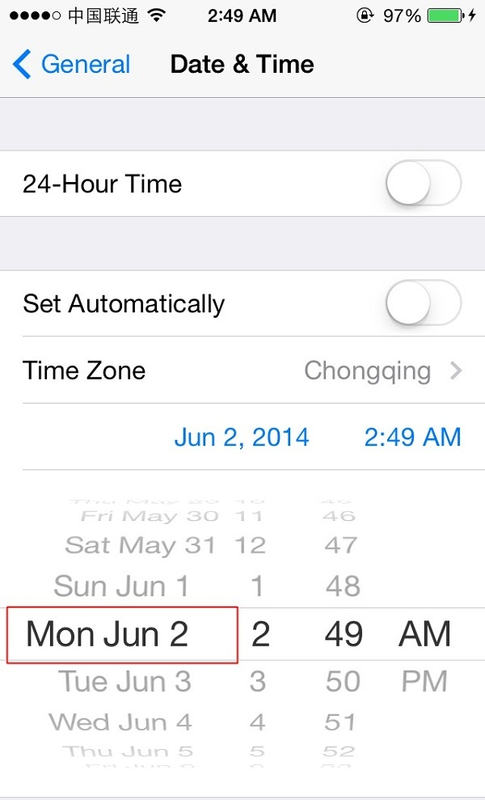 Pangu Jailbreak Tool should set your date settings automatically in Settings > General > Date & Time back to 'Set Automatically'. You can now install the 'Afc2add' and ipa crack tweak 'AppSync' from Cydia via Add Source; http://apt.25pp.com from 25pp source.